April 11, 2018 – …STILL CRAZY AFTER ALL THESE YEARS! In the course of our exchanges, my girl did mention in passing one day the river fish that we enjoy a lot – the ikan buris but no, she did not say she would like to eat it or anything. She’s the kind who will eat most anything we cook and never complains but of course, we can see the enjoyment when it is something that she finds delightful. That was why I went to the wet market early last Thursday morning to buy the fish but there were no really big ones. I did get hold of some that were big enough, not too small, one from one stall for RM7.00 and three from another stall. The next day, Friday, my girl came home for the weekend and she left her school in the jungle immediately after class, skipping lunch and by the time she reached home, she was famished, I was quite sure of that. That was why that morning, I worked on cooking the fish. I wrapped one, stuffed with chopped daun kesum and topped with a number of sprigs of dill, in daun kunyit (turmeric leaves) – all from my garden and put it in the oven to bake. Of course it would be a whole lot nicer if I had grilled it over a hot charcoal fire but, no, I did not go through the trouble of doing that. 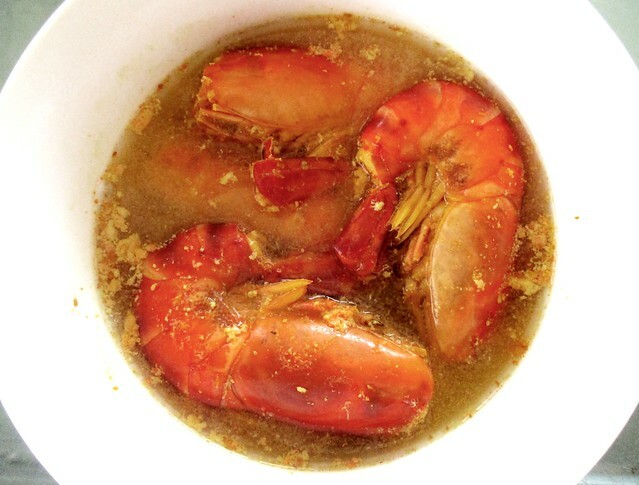 I did do the same with one big ikan sultan (from Batang Ai) not too long ago – I had bought it for our Chap Goh Meh dinner but because my mum was admitted into the medical centre that day, I did not get to cook it till much later. 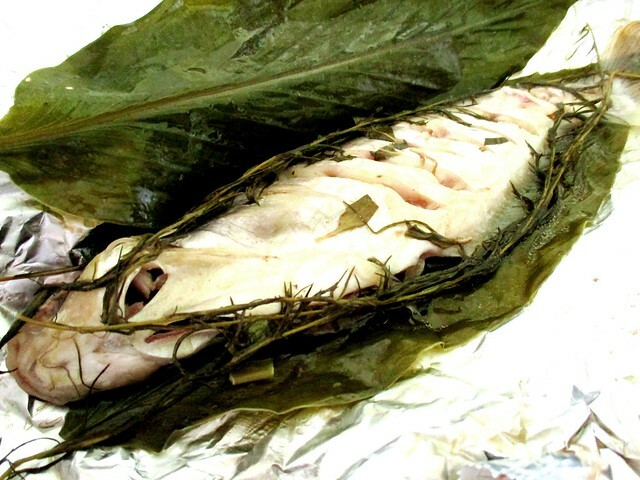 I stuffed the fish with the daun kesum and Thai basil leaves and serai and garlic, all whole and other than that, because the fish had scales, I did not cut slits in the sides. In the end, even though the fish turned out great, there was only a very slight hint of all the added ingredients. 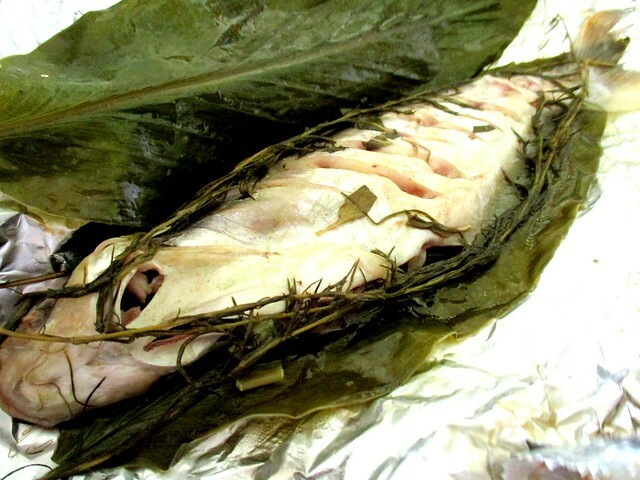 This time around, chopping up the daun kesum worked out very well and it, plus the dill and the daun kunyit used for the wrapping, sure helped enhance the taste of the fish a lot. 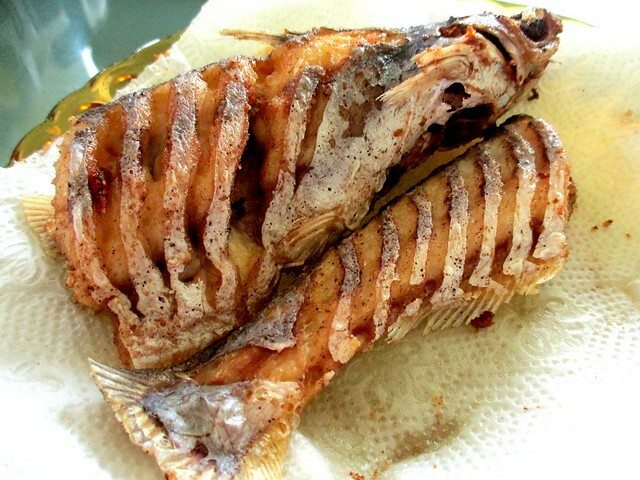 Don’t ask me why I cut such narrow slits in the fish – my mum used to do that when cooking this particular type of fish and I never asked why. I just followed. 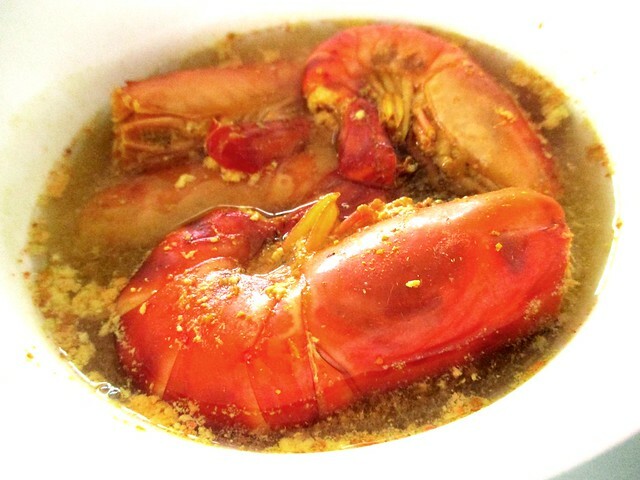 …the Melanau kampung-style or what we call masak kunyit. It would be nice to cook the aforementioned fish this way too but, no, this time around, I am reserving it specially for the crustaceans. …but we had not had these for a very long time and sure enjoyed them a lot so I guess it was worth it. My girl loved the fish, both the oven-baked one and the deep-fried and as I said earlier, she loved the soup too. She reached home past 2.00 p.m. and had her lunch right away and of course, seeing how she enjoyed the meal so much, it pleased me immensely.